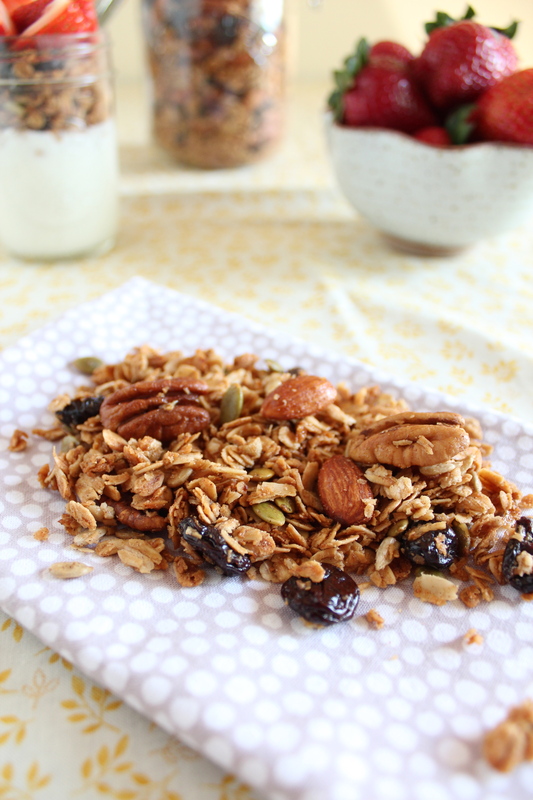 This Maple Nut Granola is loaded with goodness. Eat it my the handful or sprinkle it over yogurt for a hearty breakfast. I’m extremely happy to be back after missing in action for almost two weeks. I’d like to apologize to all of my followers for my short sabbatical from blogging. I have been extremely busy with school. I suppose some good came out of all of my hard work. My professor approached me yesterday and had nothing but good things to say about my paper. He wants me to consider publishing it. What? Me, publish a paper. I was completely shocked and totally honored that he considered my paper worthy enough to publish. Who knows, I may be a published author soon. I’m thrilled! It felt great to get back in the kitchen. I haven’t held a whisk in almost two weeks. I almost didn’t know what to do with it. Just kidding. I was born with a whisk in my hand. I decided to make Maple Nut Granola. I’ve been stress eating a lot lately. I mean, a lot! I need something to balance out all of the stress donuts, s’mores, and cupcakes. Granola sounded like an awesome snack, so I went with it. 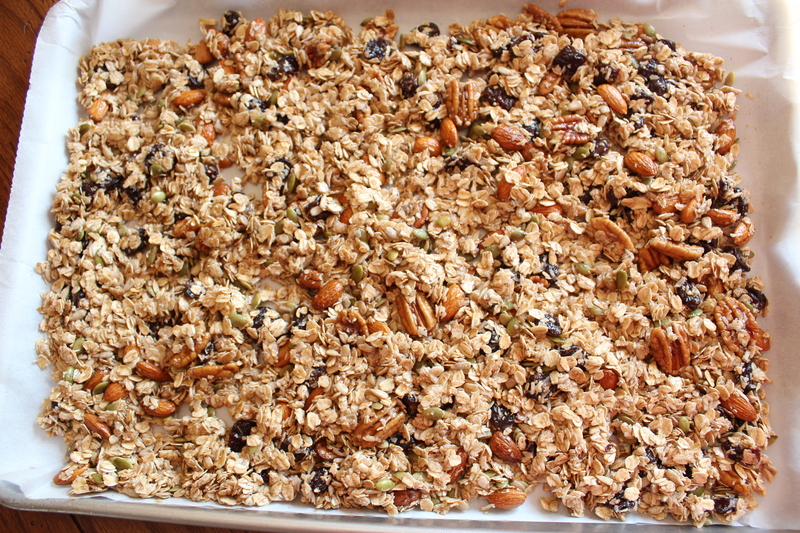 This granola is super easy to make, and it’s so good. You can’t even tell that you’re eating something healthy. First things first. 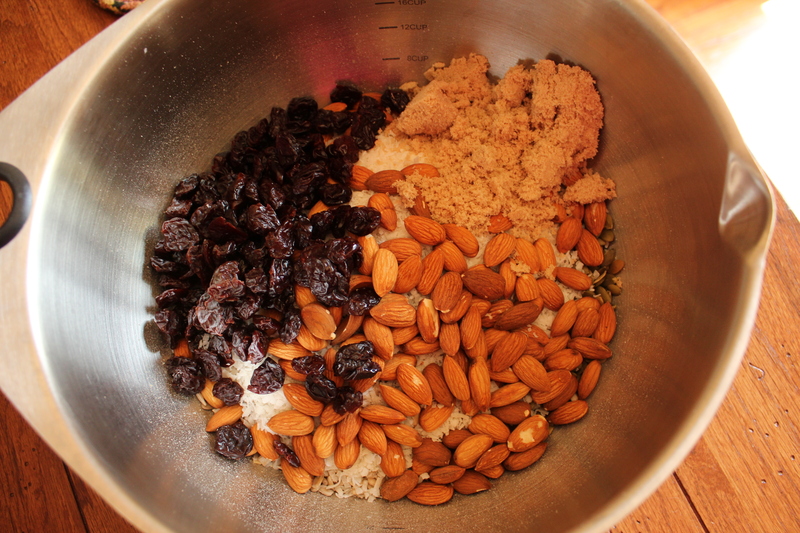 Dump all of your dry ingredients into a large bowl. Stir to combine. Easy, right? Slowly add the wet ingredients to the dry ingredients. Stir until all of the ingredients are equally coated with the syrup mixture. Line two sheet pans with parchment paper, and spread the mixture evenly onto the pan. 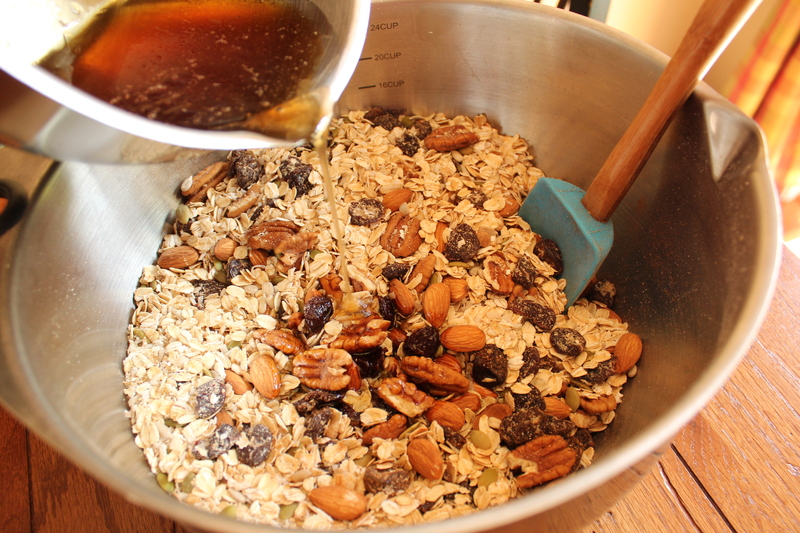 Bake at 250 degrees for 40-45 minutes, or until the granola is a toasty, light brown color. Feel free to eat the granola by the fist full (I do it all the time), or sprinkle it over greek yogurt and top it with fresh berries for breakfast. 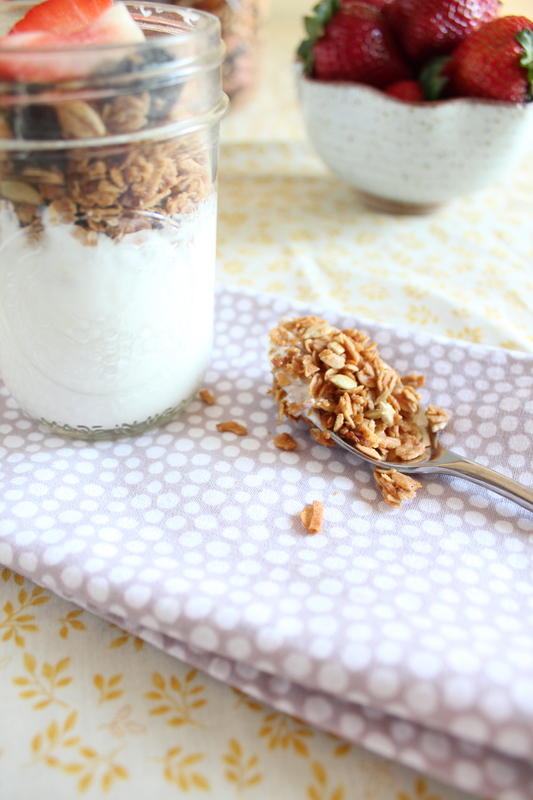 Greek yogurt sprinkled with this Maple Nut Granola is my favorite breakfast. It’s quick, healthy, and filling. It keeps me full until lunch. I can’t say that for too many other breakfast items. Mmm, a heaping pile of granola- yum! This granola is full of good stuff. Tons of oats, flaky coconut, piles of nuts and seeds, and dried cherries. A spoonful of this will make you happy. Trust me! Preheat oven to 250 degrees F. Line two sheet pans with parchment paper. In a large bowl, combine oats, coconut, brown sugar, cinnamon, salt, sunflower seeds, pumpkin seeds, almonds, pecans, and dried cherries. Stir to combine. 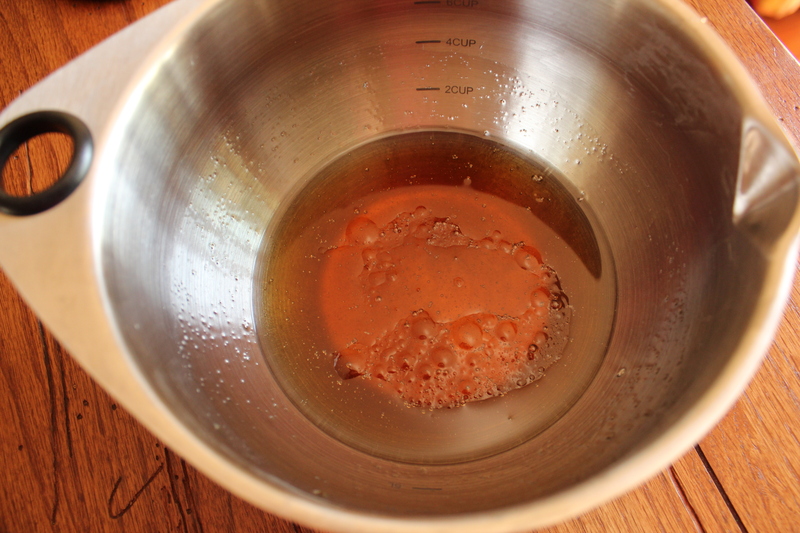 In a medium-sized bowl, combine maple syrup, honey, and canola oil. Whisk to combine. Slowly add the syrup mixture to the dry ingredients. Stir until all of the dry ingredients are equally coated with the syrup mixture. Divide the mixture equally among the two sheet pans. Spread the mixture evenly onto the pans. Bake for 40-45 minutes, or until the mixture becomes light brown in color, stirring the mixture every 15 minutes. Let cool completely on sheet pans before serving and storing. Eat the granola by itself or sprinkle over greek yogurt and top with fresh fruit. Yesterday, I had granola for lunch. That I bought from…the store! *gasp* I need to make this! Thanks, Jen. It feels so good to be back. I love granola. I’m eating it for breakfast. Congrats on writing that impressive paper for your professor!! I bet that was a great feeling when he told you should think about publishing it! That granola sounds super good, too! I am always looking for portable, healthy snacks to have with me! Thanks, Jessica. It was an amazing feeling. Great looking granola! :) My daughter just finished her last paper this week, too…I don’t envy either of you. Congrats for doing so well (and making such tasty stuff)! Thank you, Cathy. I wouldn’t envy us either. Thank you for the lovely comments. Good luck to you daughter. Welcome back my friend! I have missed your posts!!! This granola looks simply divine and I know I will love it! Thanks, dear. I missed blogging and all of my lovely followers. You’ll be seeing plenty of me over the next few months. Granola does make for the best snack, very filling and healthy. Also, your choice of flavor -maple nut, makes it very open to using it in several different ways. Glad you finally got a chance to post. Enjoy the weekend! Thanks, Tina. I’m so glad to be back. I missed everyone. This looks delicious. I’m not a fan of yogurt, but I have to eat it and topping it with granola is the only way I will eat it. I’m gonna try this recipe. Thanks, Rayna. I hope you enjoy it. Let me know what you think. Thanks, Steph. I’m excited to be back. 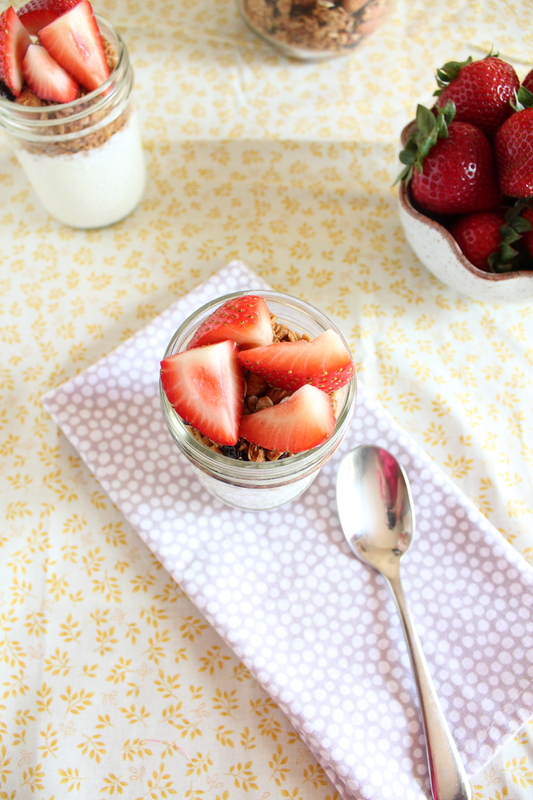 Your granola looks amazing! Congrats on your paper ! Thank you so much. You have to prove yourself every step of the way, and that piece of paper works wonders. It’s an expensive little piece of paper, too. Thanks, Peggy! I am beyond excited, but I’m also glad the semester is over. yay, you’re back!!! Congrats on the paper and good luck with getting it published :) that is so awesome! 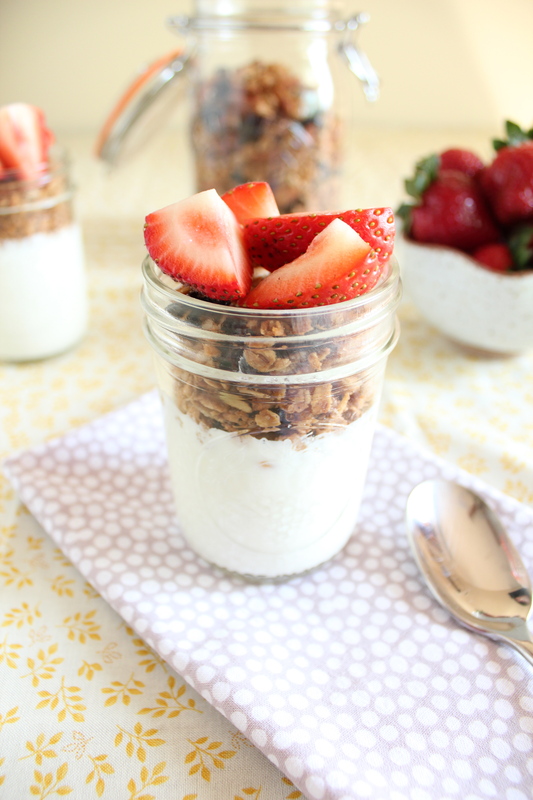 this looks like delicious granola, i definitely need to make it! Thanks, Jenn! I’m thrilled to be back. I miss baking and eating. It’s very nice to meet you, Maggie. Hmmm, I wonder why it never turns out. I’ve made this recipe at least ten times. Hey, pancakes sound delish. I can tear down an entire stack, no problem. I love granola so much! This looks fantastic! Perfect to eat alone, on yogurt, or as cereal! All of those things sound so good. I love snackin’ on it. Welcome back! Granola looks great. I’m addicted to the stuff. Thanks. It feels good to be back. Wow, congrats on your paper and graduation! This granola sounds awesome. I also love Greek yogurt and granola for breakfast, so I’m always on the lookout for new granola recipes. Thanks for sharing! Thanks for visiting, Kelsey. This granola is amazing. I just made it, and it’s almost gone. Thank you so much. I love homemade granola, too. The store bought stuff just doesn’t cut it. Congrats on your paper! That would be so cool to be published, good luck!! Thanks, Kristina. The coconut gives the granola a lovely sweetness. 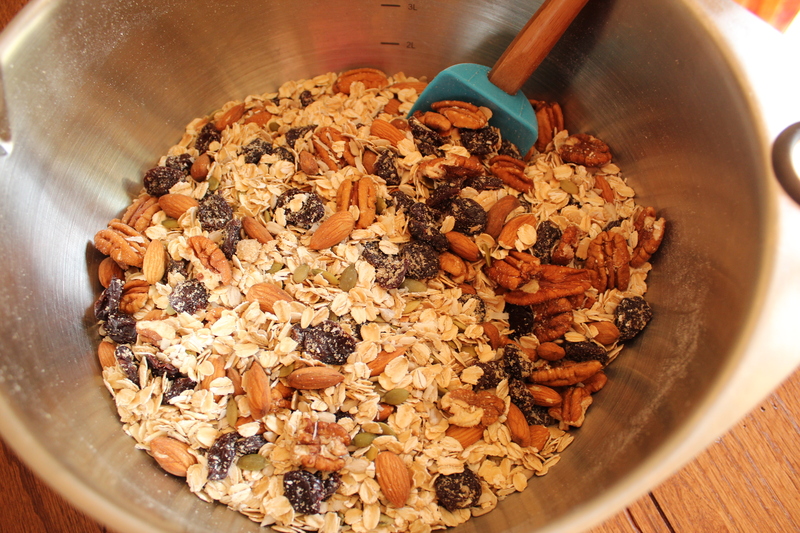 LOVE homemade granola…Especially those that are heavy on the nuts & seeds. I’d have to leave out the coconut (I’m a weirdo who doesn’t like it! ), but this recipe sounds brilliant! Thanks for visiting, Rachel. I’m not a huge fan of coconut, either, but you barely notice it in this recipe. It’s there to add a touch of sweetness. The postcards via snail-mail are really effective. For my current show (opening was this past Friday evening), I did the large over-size cards, the image of one painting on the front, and two small thumbnails on the back, with return address of the gallery, and info/dates, etc. about the show. I’m thinking quarterly is a good idea…and people do seem to hold on to these (pretty) postcards for a while! And…I did find that one of my sales came directly from the postcard, before she had even seen the work in person. (she just wanted to be texted a photo of the frame it was in….she loved it, bought it!). She was leaving on vacation & wouldn’t make it to the opening, but didn’t want to miss getting the painting she wanted! Made this. Added some flax seeds and didn’t have any sunflower seeds but it is the best granola I have ever tasted!